If you’re one of eight thousand people lucky enough to attend PDC 2008 last week and receive the ultra-cool 160GB portable hard drive with “the goods” then I have some extra good news for you, your hard drive can also become a bootable Windows 7 install disk. The best part is that you don’t even have to delete any of the existing files on the drive since there’s about 90GB free of the 160GB drive. This is especially handy if you’re trying to install Windows 7 on a device without a DVD drive or if you don’t have any blank DVDs to burn the ISO on. Of course this guide also works if you have an existing portable USB hard drive that has enough free space to partition and a copy of a Windows 7 ISO, which I’m sure you can get *wink*. Step 1: Click open the Start Menu, right click on “Computer”, “Manage”. Open the “Disk Management” tool. Step 2: Find the USB hard drive, should be 149.05GB. Right click on the volume and click “Shrink volume”. Shrink the volume by 10000MB. Step 3: Right click on the new unallocated volume, “New Simple Volume”, format as “FAT32”. Check “Perform quick format” unless you have time to waste. Step 4: Right click on the new volume, “Mark Partition as Active”. Step 5: Mount the Windows 7 ISO from the USB (\Windows7\ISO\6801.0.080913-2030_Client_en-us_ULTIMATE-ULTIMATE_GB1CFRE_EN_DVD.iso) using your favorite ISO tool (I use Daemon Tools Lite). Step 6: Copy the entire DVD directory into your newly created volume. Step 7: Now take your USB drive and tell the PC to boot from USB. The Windows 7 setup should appear. To restore your USB drive to the previous state and reclaim the 10GB of space, simply delete the new volume created and extend the original volume to consume the entire 10000MB now unallocated. Nice article, although I didn’t get to go to the PDC, so I’m not sure how useful this article is for me :P.
Similarly, 20 GB space can use to house both 32bit and 64bits of vista,7, and 2008 all together. Isn’t it awesome? Thank so much Long, your solution is much more simple and easy to set up. Great post thank you! I look forward on trying this to get Windows 7 on my DELL 9 Mini. This is just a beta right? I bought a new WD portable HDD recently, & I’m happy that I could use it for booting Windows 7 from that…. Im very confused – why FAT32 and not NTFS? With the falling prices for USB Flash drives (especially the larger 8 GB size), that, combined with this trick, will make the external USB flash drive the install medium of choice for technicians (especially in enterprises with many far-flung desktops). Say that you have a half-dozen such thumb drives, with each a different color. Put them on a keychain, and you have a portable installation and upgrade toolkit for the enterprise from the server closet to the smallest laptop (even laptops support booting from USB). Is it possible to boot from a vhd natively in 7 yet? I am very curious about it. Maybe you should just wait a little more than just 6 hours before expecting an answer? This isn’t a chatroom, after all. I’m quite curious about VHD booting myself, though. From what I can see in the current build of Win7, you can’t boot from VHD yet. You can mount though. hi Long – could you do a write up on how to do a dual boot vista/7 ? would be VERY appreciative! thanks! 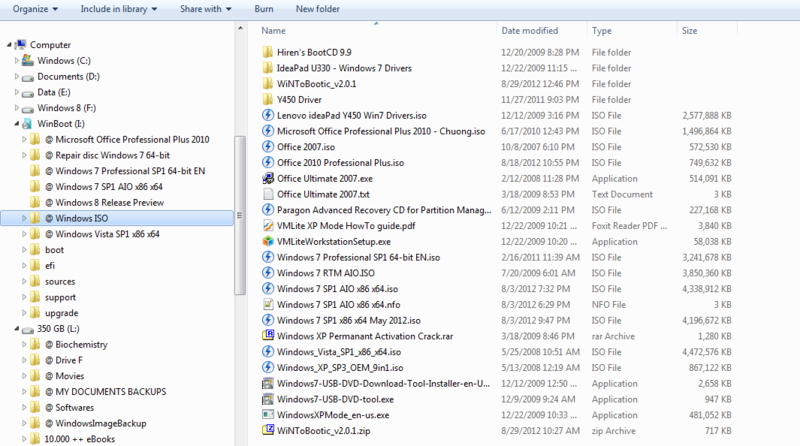 I didn’t get to go to PDC2008, but I do have a Windows 7 ISO Image file, and I’ve got it in Virtual PC. Does anybody have a product key? Look for the VHD options. There you have it. ignore the /hypervisorsettings as it just sets hypervisor debug options. @Mike: I tried playing around with the VHD settings in bcdedit but couldn’t figure out how to actually get it to boot. Ok, I have it mounted in the boot manager now. The command is bcdedit /set device vhd=[yourmainosdrivehere:]\ and voila! 😀 Testing to see if it installs now. 🙂 Remember to set it as active. Wait a moment, let me double check. Don’t try this just yet. I tried something else before and I had to do startup repair lol. Mac has this ability at least a decade ago. LOL. Boot from zip disk, firewire HD, USB HD with much easier way. Regarding the bootable USB HDD issue: I must be missing something. I thoght the BIOS in PC’s are not capable of booting via USB. If it is possible I would do a claen of WIndows 7 on myMAXTOR 4 +. 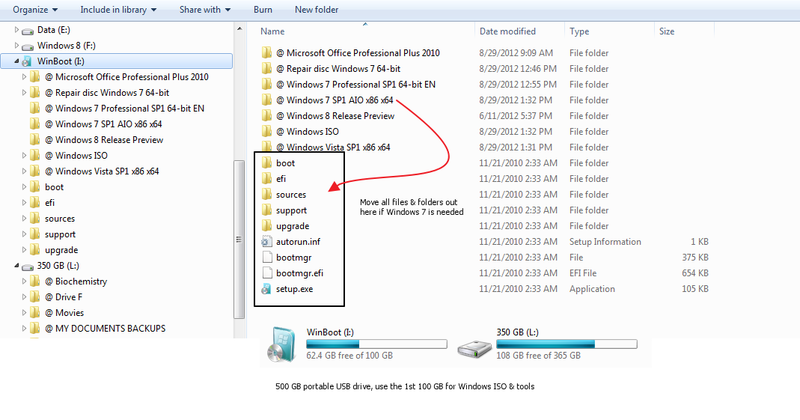 USB drive and run off this drive when I want experiment with Windows & beta. Help? Take a look at your bios, boot options. or look for bios upgrades….. a lot of PCs allow you to boot from usb & to choose from several bootable drives. Well I tried every which way but this doesn’t appear to work. A build 7000 quirk? Who knows? I get as far as choosing which partition to install W7 on and then I’m told that Windows won’t install from a USB device. Yes I’ve checked my BIOS and all is good, it appears to be W7 that won’t play nicely. I just realised I’m a doofus. You can also use winrar to extract the ISO image. No need to mount on virtual drives. So I’m trying to install Windows 7 with a USB key, and it’s not working. I can format the USB drives within Computer Management, but when I right-click on the partition, “Mark partition as active” is dimmed and unselectable. Help! Where am I going wrong? What if I’ve already deleted the contents – is there a link where I can download all the files again? If I format and copy over a Win7 install partition as given above on my 8 gb data traveler 100, don’t I need to copy over a boot sector command to get it to boot as first device? Or is copying as a mounted device placing the boot sector where it is needed? Other less inventive tutorials all require running diskpart commands on boot sector files. Can I do all of this to it’s own primary partition on the USB stick, then create another non-bootable data partition to carry my apps and files around? Geek Squad tells me I can put multiple bootable O.S. on the same stick and use a boot manager to select the one to boot from. However I cannot imagine wanting anything except Win7 all-sku’s for the foreseeable future, and so having just that in its’ bootable partition and my apps/files in a data partition would make me the perfect travel stick. I need to say this I’M IN TROUBLE !! Well, I copied all the files to my USB HDD and deleted the Image file. I tried to boot with the USB HDD but it did not boot up and I’m stuck. I used Nero to create an Image but my friend told me it needs to be an exact same image that I got from Microsoft before I deleted it. HOW CAN I CONVERT THE LOOSE FILES BACK INTO THE SAME BOOTABLE IMAGE SO I CAN BURN IT ON A DVD? U cant buddy, While copyind there is something called boot image which is not sopied, so the nero or any other software needs that image to make the disk bootable. U cud have used Barts BBIE(Barts Boot Image Extractor to get the image). U need to download the iso again. I have tries the method above, it did NOT work, I did exactly as the instructions, It has failed, any one has any ideas how to make it work????????? I have a question I was hoping someone could answer. I bought an adapter that would allow one of my Hard Drives to be accessed via USB. I bought one and it works great, but I decided to install Windows 7 Ultimate build 7068 and my computer said that it could not install a fresh copy of Win 7 unto a USB device. Okay, if that was the problem I decided to remove my CD RW drive and connect the hard drive instead. I then connected the CD-RW drive to the USB adapter and it worked perfectly. I was able to use the CD drive to install onto the hard drive. I then decided that I didnt want to have my computer looking like a disassembled piece of junk, so I thought, “Hey, why not reconnect everything how it was, and just boot up Windows 7 from USB”. So I chose Windows 7 only to have the computer reboot. Am I doing something wrong? Did I mess up the Main Boot Record since Windows 7 was installed from IDE instead of being connected from USB? Is there a way to get my computer to allow me to boot up without the restart? Let me know if anyone has any ideas or needs any more relevant information. Windows 7 will NOT boot from an usb device, windows is very annoying that way. Is it possible to install the full Windows 7 system (not just the installer) on an external hard disk ? press any key to restart? I just tried this with Win 7 RC1 to a USB hard drive. Win 7 does not allow installation of the OS to a USB hard drive. You can install the OS to non-USB drives from installation files contained on a USB flash/hard drive, but just can’t install the OS to a USB drive and run off that drive. The installation files run fine, Win7/M$ just doesn’t allow it. Simply nothing happens when i select to boot up from usb drive…. any ideas? This tutorial is for using USB drive as an INSTALLER for Win7. I use my USB flash to install so haven’t tried it on larger drive, but I know that MS has blocked the installation of the full Win7 OS onto any USB device. I was hoping to set up my laptop to boot from the internal HD with XP Pro, or from a USB external with Win 7. Win 7 refused to install on the USB hard drive, so I swapped it with the XP one, and installed Win 7 to the new one as the “resident drive C”. That will happily boot Win 7. XP won’t boot from its previous drive C in the USB slot. Win 7 in the USB slot starts, and gives a BSOD error. I think it’s clear that, as said above, you can’t boot Windows from USB. I’ve got Fedora Linux on a USB flash drive, complete with e-mail config and all sorts, and that boots no problem. anybody run this action’s article? I would like have my AcerOne with W7 RC.. anybody have a nice link to do it? I went through all the steps (used a Vista machine to shrink the partition, but have an XP 32bit OS myself), but I just can’t mark the partition as active. It’s not currently active, though the main partition is marked active. FYI, Paul, you have to shrink volume using vista. XP doesn’t have that option 🙂 Same with the ‘simple drive’ option. I had to create a extended partition, and then create a logical drive to format it. Not sure if it will work, but worth a shot. I have followed this guide step by step completely, missed nothing. I even tried formating a partition using windows vista. But it still won’t boot from my USB HDD. Says NTLDR is missing, which is what it says when I forget to connect my hard drive with windows on it sometimes. There is no such option as “shrink volume” on an XP so it wont work unless i have Vista? will this mean that my 7 OS is in my External Hard Drive and i can boot my PC with my External as primary? what does it mean when you partition a 10 G Volume? is it for the 7 OS or it’s just for the ISO? Formatting Hard-Drive in NTFS also works ! Dumping the files on any external hard disk without a boot sector (NTFS or FAT32) and marking the partition as active should do the trick. bootsect /nt60 X: where X is the volume letter of your usb hdd. I have mounted the 7.iso file, and copied the contents to a 4gb usb drive formatted for FAT32. But when I boot my computer from the usb drive it gives “Disk error”. Any ideas? well, it is great for install windows to hard drive… but I want to install windows from DVD to USB / Removeable hard drive.. Let me know.. My Bios does not have that option.. Offense against gays it’s crime. Hi, I have a 1GB USB stick and cannot get the “shrink volume” or “Mark Partition as Active” up. Can any shed some light on the matter? thanks, hope it works, this will save me, my cdrom i broken, have only 2gb usb, and 500gb usb hdd, i was afraid i’ll have to format 🙂 , all clearly stated in instructions. okay i tried doing this on vista since i jst wanted to restore my laptop but it doesnt seem to work any tips for vista users coz i followed your guideline to the letter and my laptop is jst black for at least 10 minutes so i restart it… please help..
how to Shrink volume the Drive in Windows XP ??????? SOLVED! Issue with invalid ISO loading in windows 7 usb/dvd download tool can be solved by first, installing POWERISO and register it so that you can modify the properties of the ISO file you want to load on your USB flash drive, once you have done it, open your Windows 7 ISO with POWERISO, from file go to image properties, check the UDF box then save the ISO file by replacing the original file or saving as your desired file name. Please note that if you were not able to register the POWER ISO, you will not be able to make any changes with the Original ISO you are trying to modify. From the Windows 7 USB/DVD download tool, browse and choose your modified ISO file then it should start loading to your USB drive. you can now make a bootable format with NTFS for flash drives, Usb drives, and external drives. IT WORKED! THANK YOU SO VERY MUCH!!! Pingback: making a bootable harddrive/flashdrive. Pingback: Windows 8 : Pronti ..partenza… aspè se ne parla l’anno prossimo « Go Microsoft !!!!!!! Pingback: Installare Windows 8 da un chiavino o Hard Diks esterno USB ? Un gioco da ragazzi #Tips #W8 #USB « Go Microsoft !!!!!!! Does the size of the partition matter? I have 100GB partition formatted as primary active. But when boot from it, only see flashing a dash line. can i use this method to hold 2 installers eg. vista & 7 install disk? Support ISO, DVD or Folder as boot disk source. Basically it will flash the bootloader or bootsector from source onto your flash or portable usb drive, then copy the source over. I have a 500GB Western Digital portable usb drive. I reserved a 100GB partition (primary, active, drive letter L for reference) for storing all kind of Windows iso in a folder called @_Windows_ISO. I have each windows iso version extracted onto a separate folder (name with @ character in front to avoid mistake with regular folder). If I want to install Win Vista for example, I move all the files & folder inside @_Windows_Vista_x86_x64_AIO to L:\ then plug it in PC need installation-> It just works. One thing I found out about the tool is that no formating is needed. In my case I already have all that folders set up beforehand, then I use the tool to flash bootloader and one Windows 7 iso as source to make the USB drive bootable. Don’t really understand Step 5. (The mounting part). Can you pls give a step by step process on how to do the mounting and copying of the files. Pls reply asap! Thanks. Thank you so much for valuable information.its working 100%.